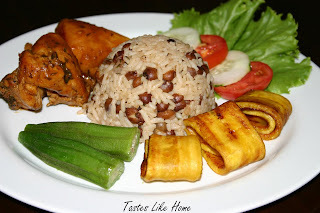 This dish of peas and rice, stewed chicken, fried ripe plantains, steamed okras and simple salad of lettuce, tomato and cucumber is my entry to Jugalbandi's Postcard series. The recipes are on the postcard as well. Enjoy.